Life in the Philippines will never be the same without advanced technology. Thanks to innovations and progressive developments, Filipino lives continue to improve. With this in mind, Tradeshow and Events Management Corporation (TMC) will launch Manila’s biggest tech expo, Consumer Electronics and Information Technology Expo (CEITEX) Manila 2018. Happening on May 13 to 15 at Halls 3 and 4 at the SMX Convention, CEITEX Manila is set to be the premiere event of the local ICT industry. Not only will it create a universal space for the country’s tech community, but it will also promote both local and international products and services directly to high end users. “If you’re tech-savvy, this is the place to be,” commends Mr. Ric V. Angeles, President and CEO of Angeles Holdings. Organized by his very own TMC and Swedish Designs, the three day interactive trade fair will be showcasing consoles, gadgets, and appliances. But CEITEX isn’t just a bazaar show. Headlining the event are exhibitions of robotic products, drone demonstrations, e-gaming and augmented virtual reality (VR) tryouts, and sample use of the newest web applications. Exhibitors will also prepare fun activities that will allow interaction among the visitors and their products, creating an exciting environment that everyone will surely enjoy. With over 240 exhibitors, the show will connect businessmen to market trendsetters from different parts of the world, expanding companies’ business relations from here to abroad. “This is our objective: to connect local business people and foreign manufacturers, as well as retailers,” shares Mr. Angeles. Organizing a major tech expo is no easy feat, especially if it’s a first for both the company and the country. But for TMC, CEITEX is necessary for the improvement of the country’s tech market. More than anything, the events company is also hoping that the expo will educate and expose Filipinos on the different fields of technology on a global scale. 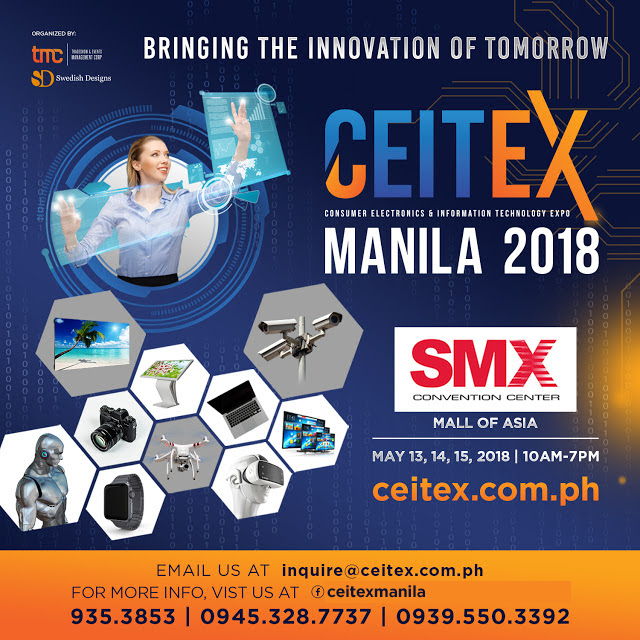 CEITEX Manila 2018 is open to businessmen, students, tech enthusiasts, and curious citizens. The doors are open from 10 A.M. to 7 P.M. For more information, contact inquire@ceitex.com.ph.